An excellent choice for installations without the use of PVC glue. Works best with barbed fittings and stainless steel hose clamps. Flexible PVC pipe makes installations quick and easy. Its durability and ability to be glued into standard schedule 40 PVC fittings is its main advantage. A bottom drain can be said to be one of the most important parts of a pond installation. Find standard and retro fit here, as well as gate valves. Check valves prevent water backflow when the pump is not operating. Fill valves automatically add water to features and ponds when needed. 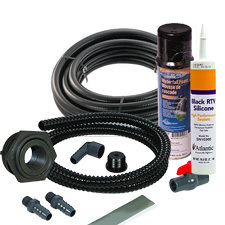 Use expandable black waterfall foam to stabilize stones and fill voids to redirect water flow. Use applicator guns for easy installation. Silicones and PVC cement are also available. Extend your aeration system's reach with Direct Burial Tubing. Designed for underground applications, with a rigid wall making it highly resistant to deforming and crushing.